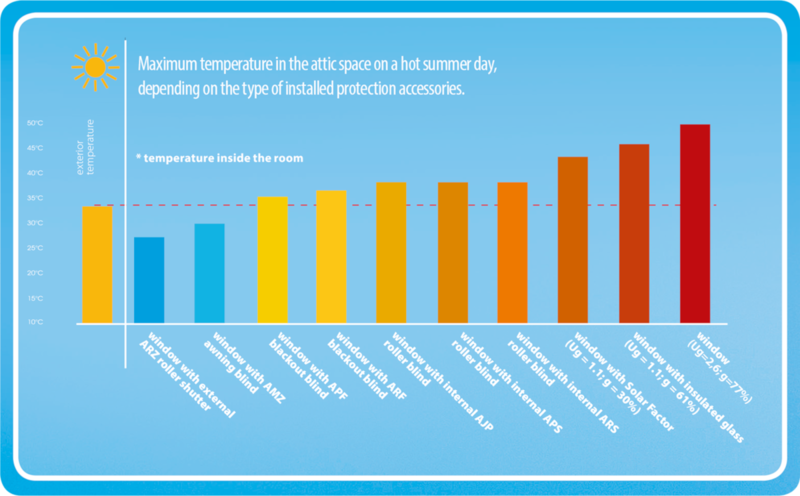 WHICH ACCESSORIES PROVIDE THE BEST PROTECTION FROM OVERHEATING? According to the DIN 5034-1 norm rooms should be protected from overheating with the use of external accessories (awning blind, roller blind) which give better protection than internal accessories. PROTECTION FROM OVERHEATING - HOW DOES THIS WORK? 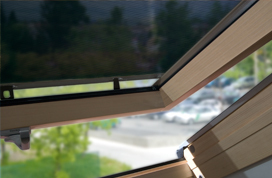 FAKRO, to improve its products and increase the comfort of users, is constantly analyzing the effectiveness of protection from the heat using different shading devices. To this end, there have been prepared eight exactly the same research rooms, which are identically exposed to sunlight and equipped with the same roof windows. The study was performed with closed windows. The temperature was measured at several points, one meter above the floor. On the windows, there were mounted different accessories and the results of the research are presented in the chart. The investigation results above show clearly that external accessories (awning blind and roller shutter) provide the best protection from outside heat. The optimum sun protection can be acquired be external awning blind, bearing in mind heat protection and ease of installation. 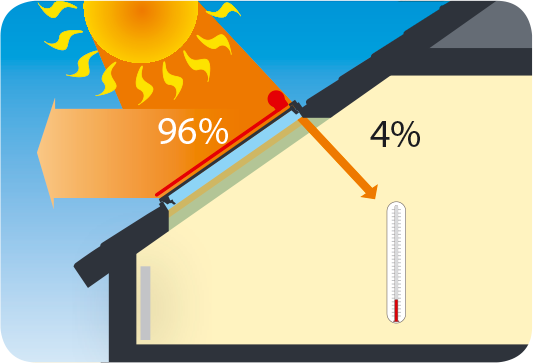 Internal accessories also offer protection from the heat but to a lesser degree than external accessories; their main function is to decorate the space and regulate the amount of light entering the room. 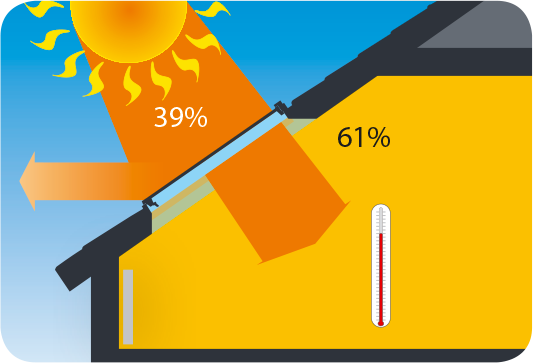 Solar radiation coefficient ’g’ informs about the amount of solar energy reaching the glass which penetrates into the room. 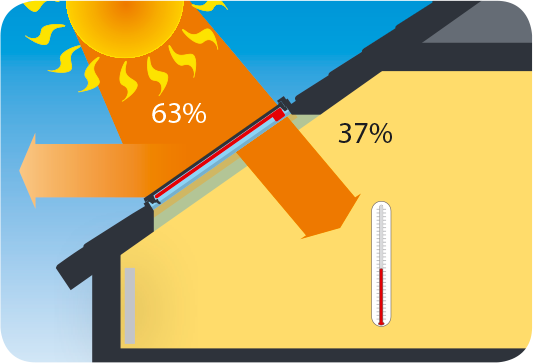 The higher value of ’g’ coefficient, the room heats up faster. The external awning blind offers up to 8 times more effective protection in comparison with internal blackout blinds. External accessories offer the best protection from high temperatures. 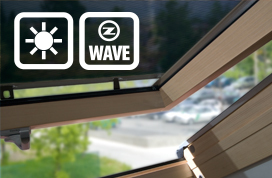 They absorb UV radiation, protect the external glazing and keep warm air outside. 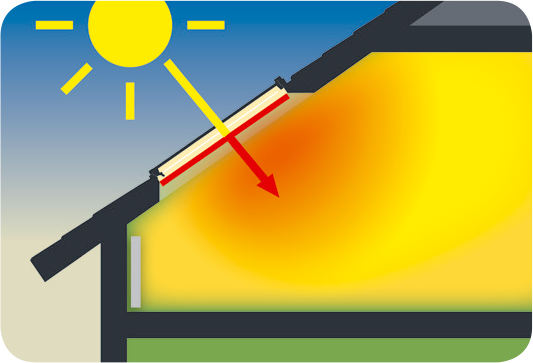 Thermal radiation which passes through the window pane is absorbed by an internal blind so the heat radiates to the interior in the form of long wave infrared radiation which is not transmitted back through the glass back to the outside. 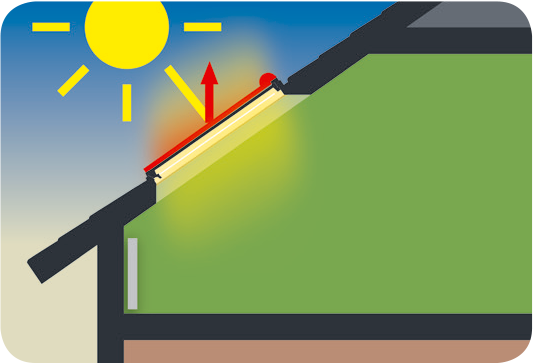 The blind acts as a radiator causing overheating, particularly on south-facing roofs. 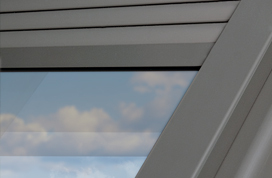 The external awning blind together with an internal accessory installed on a FAKRO roof window creates a set of accessories which ensure the highest levels of comfort in the loft space, because they protect from heat and light and decorate the room.